He is the eye-catching filmmaker and musician most people will recognise for being clean shaven on one side of his face while sporting lengthy locks and a full beard on the other. 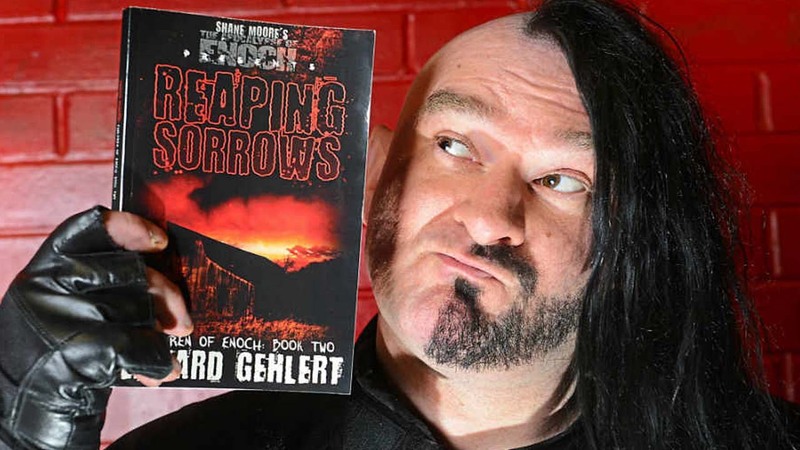 Now Stourbridge’s Nick J Townsend has conquered another medium after becoming a character in an American horror book. The multi-talented entertainer is one of the main protagonists in Reaping Sorrows (Children of Enoch Book 2) by author Edward Gehlert. Nick said: “He [Gehlert] contacted me about a year ago and said he had been following my career. Then he said ‘I would really like to use you as a character in my book’. Nick spent around six months basically talking Gehlert through his own character including how he talks and reacts to different types of situations. He added: “He has made me a central character having to meet others in the book and explain who I am. “In his universe children turn into demons by the age of 13 and I am there slaying them. There are swarms of insects tearing people apart. It is wrath of God type of stuff. “Then there are all these questions like is this the rapture or am I in hell? “It is a really well-written book. Unlike other books of this type you do not know if all of the characters are good or not. In one sense they are the heroes but there is also a lot of ambiguity about them. “The bottom line is I am a fictional character in an American horror book. Reaping Sorrows, which is illustrated by Kendall Hart, was published on April 6. It is the follow-up to author Edward Gehlert’s Dark Harvest (Children of Enock Book 1) novel. The book is available to purchase on numerous online book stores including Amazon. Recently Nick had his portrait put on canvas to be hung above the bar in Kidderminster Town Hall as part of a music heritage trail being developed around the town. Last year the former University of Wolverhampton student made a 50-minute mockumentary whilst in Los Angeles, called Clingfilm, which featured at Birmingham Film Festival. It examined why people moved to Hollywood to start lucrative film careers and the challenges they face along the way.